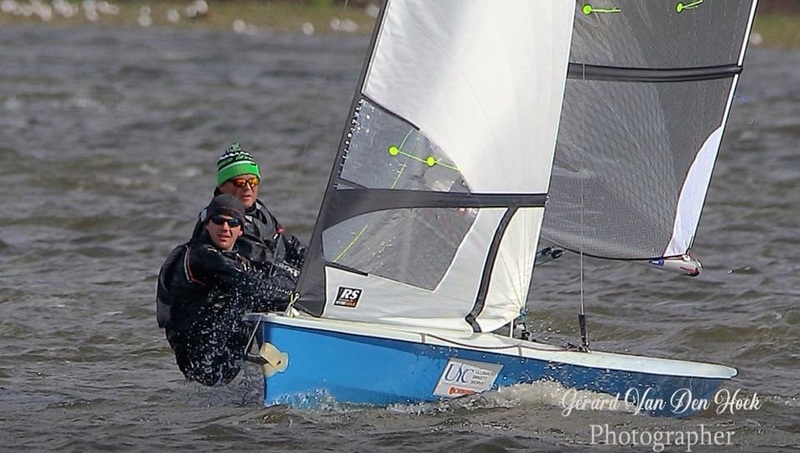 Hamish Gledhill and Simon Dowse of West Riding SC won the RS400 Rope4Boats and Rooster Winter Championship over the weekend of 23 and 24 March at Leigh and Lowton Sailing Club. Gledhill and Dowse finished the series with a two point advantage ahead of Chris Pickles and Matt Sharman of Bassenthwaite SC, with Richard Catchpole and Gary Coop of the host club one point further back completing the podium. Pickles and Sharman (2,2,2) were first day leaders after three races, with Gledhill and Dowse (1,5.5,1) in second and Catchpole and Coop (3,1,6) in third with just four points covering this leading group. A solid F4 blowing straight down Pennington Flash awaited them for the 4th race on Sunday morning, and this saw a new set of race leaders. Micheal Sims and Andrew George of Carsington SC took the win in race 4, and Jon Heissig and Nicky Griffin of LLangorse SC won the final race, while Gledhill and Dowse managed a crucial third place. With the wind hitting force 6 for the final race, it was a depleted fleet for the demolition derby. Pickles and Sharman looked to have the championship in their grasp when they blasted past the capsized Gledhill and Dowse. But the PRO took the decision to abandon due to the carnage, handing Hamish and Dowse the event, which Hamish later graciously acknowledged was mostly down to the fact that he was wearing his lucky socks!